Who's Who in the 1991 Int'l Taijiquan Conference in Yungnian County, Hobei Province, China. Front row from left: Wu Yinghua, Sun Jianyun, Ma Yueh-Liang, Yang Zhengzhi, Fu Zhongwen, Feng Zhiqiang, Pu Gongda; back row from left: Qiao Songmao, Yang Zhenduo, Wang Haizhou, Huang Zifu, Liu Jishun, Chen Zheng Lei, Wu Wenghang. It is said that the smaller movements and more restricted style of the Wu Form (in comparison with the Yang Style) has its origin in the elaborate and restrictive clothes of the Imperial Court. In order to be able to practice combat in this apparel the movements of the original Yang Style had to be modified somewhat. For many years there was no differentiation between the Yang and Wu Styles. There was close contact between the two families and, for instance Wu Jian- quan and Yang Cheng-Fu would practice Push-hands together. Quan-yu taught the style to a number of students, including his son Wu Jian-quan. He, in turn passed his teaching on to his son Wu Kong-yi and students Ma Jiang-bao and Cheng Wing-kwong from whom many of today's Wu Style students descend. Currently the Wu Style of Tai Chi is second in popularity only to the Yang Style. Wu Jian Quan style Taijiquan is second in popularity only after the Yang style of Taijiquan. It is in fact representative of the Yang style Small Frame which was developed and taught by Yang Lu Chan, the founder of the Yang style, for the students in the Imperial Court. The founder of Wu Jian Quan style Taijiquan is Wu Jian Quan's father Quan Yu (1834-1902). Quan Yu was one of Yang Lu Chan's top students and was said to have gained his master's skill in evasive techniques. He worked as a bodyguard in the Imperial Court and was Manchurian by race. Wu Jian Quan (1870-1942) did the most to popularise this style of Taijiquan and the style is named after him. Because of his efforts, many people came to learn this style of Taijiquan and his form soon became the accepted standard for this style. When Yang Lu Chan began teaching in the Imperial Court through the recommendation of Wu Yu Xiang's brother. He encountered conditions which merited a modification to the form he normally taught. The Imperial Court Dress had long sleeves and long robes which made certain movements awkward, these factors had to be taken into account in order for the art to be used effectively for combat in such clothes. What resulted was the Yang style Small Frame. This is primarily a modification of the Old Yang Form to take into account these factors. It was smaller in terms of movements and its postures allowed combat in the restrictive clothes of the Imperial Court. The Yang Small Frame comes down to us also from Gong Tian Ren who was also a student of Yang Lu Chan in the Imperial Court. It agrees substantially with the early Wu Jian Quan style set. Because the Yang Small Frame was different from the Old Yang Form that Yang Lu Chan taught before he was in the Imperial Court and at his private classes. There arose a misunderstanding that he taught a watered down `Manchurian' directed form in the Imperial Court and a secret `Han' form to his family and close students.15 This was not the case, his family knew the Small Frame and taught it as well and some of the Imperial Court members like Wang Lan Ting who practiced outside with him also practiced the Old Yang Form. Other than the postural modifications to take into account the dressing differences, the art remained essentially the same. Quan Yu taught many disciples his art and three main streams come down to us from him. Wang Mao Zhai (1862-1940) who taught the famous Wu Jian Quan style master Yang Yu Ting (1887-1982), Chang Yun Ting (1860-1918) and his own son Wu Jian Quan. From these three lineages come the modern masters of Wu Jian Quan Style Taijiquan, like Mah Yueh Liang, Wu Ying Hwa, Wu Kong Yi, Wu Kong Zhao, Eddie Wu, Wang Pei Sheng, Ma You Qing, Chang Yun Jia and many others who carry on the task of promoting the art. Quan Yu is recorded as a disciple of Yang Ban Hou and indeed he had trained under Yang Ban Hou as Yang Ban Hou would assist his father in teaching the classes. But he was primarily a student of Yang Lu Chan. One must understand the importance of status in the Imperial Court. Yang Lu Chan instructed not only soldiers and bodyguards but also taught the Imperial household, the princes of the realm themselves. It would be unseemly that the princes would have boxing brothers with commoners, an in terms of boxing seniority, these commoners were sometimes boxing seniors to the princes. So these non-royalty students were made to bow to Yang Ban Hou as master. This would ensure that they were at least one generation below, in terms of boxing rank, from the royal princes. When Yang Lu Chan left the Imperial Court to retire in his old age.16 Quan Yu also left the Imperial Court and lived in Beijing and taught his art to many students. He attained a great reputation as a boxer and produced many fine students. After the fall of the Qing Dynasty, in order to integrate into the predominant Han population, Quan Yu adopted a Han surname Wu for his family. Thus in some references he is referred to simply as Quan Yu and some refer to him as Wu Quan Yu. The Manchus were not well regarded by the Han people because they were the foreign ruling race which had conquered the Han ruled Ming Dynasty. The move to integrate into the Han race was important during that period of time when hatred against the ruling non-Han races was a very real thing. The style was not taught publicly until Xu Yu Sheng, Yang Jian Hou's disciple established his association in Beijing and invited Wu Jian Quan to teach there. Quan Yu taught his son martial arts from a young age and Wu Jian Quan grew up an accomplished martial artist skilled in more than just Taijiquan. Wu Jian Quan was born into a martial arts family. His father had earned his living as a bodyguard in the Imperial Court. This meant that his father was a professional martial artist whose skills were his means of livelyhood. So martial arts was very much the `family trade'. His father had trained under the great Yang Lu Chan, founder of the Yang style, and also under Yang Ban Hou, Yang Lu Chan's son. The form practiced by Quan Yu was the Yang style Small Frame but way back then, the division into the major styles had not yet taken place and the art was simply known as the small frame of Yang Lu Chan. Wu Jian Quan achieved a very high level of skill in the art of Taijiquan and was also an accomplished archer and equestrian. He also practiced with members of the Yang family and maintained a close relationship with them. He and Yang Cheng Fu would practice Push Hands together and Wu Jian Quan used to call him `Third Uncle' because in terms of lineage generations, Yang Cheng Fu was his senior by one generation. In fact, before the Wu Jian Quan style became considered as an independent style, there was no differentiation between the two families. This close association and non-distinction between these two great Taiji styles can be seen by Wu Jian Quan's sending his son, Wu Kong Yi, to study under Yang Shao Hou. There is an interesting story on how the Yang Small Frame practiced by the Wu family became an independent style. The relationship between both families was a close one and it was never the intention for the two families to form independent styles of Taijiquan. This division occured when both Wu Jian Quan, Yang Cheng Fu and Yang Shao Hou were teaching in Chen Wei Ming's Zhi Rou Association in Shanghai. The Secretary General of the association at the time, who was also a government official, was Chu Ming Yi. Chu initially studied under Yang Cheng Fu. During some Push Hands demonstrations which he did with Yang Cheng Fu, he had expected Yang to give him `face' because of his position as Secretary General and to allow him to appear skillful during the demonstration. Yang, however, regarded people by skill and not status and unceremoniously bounced him out repeatedly a great distance. Feeling insulted by this incident, he changed from studying from Yang Cheng Fu to studying under Wu Jian Quan. Because of this he promoted Wu Jian Quan and his Taijiquan vigourously whilst not promoting Yang Cheng Fu so much. This resulted in the public regarding Wu Jian Quan's form and Yang Cheng Fu's form as independent styles of Taijiquan. Despite this, the relationship between both families remained close. When Wu Jian Quan first began to teach in Beijing, he taught the Yang Small Frame as handed down by his father, Quan Yu. This form is almost identical to the form handed down by Wang Mao Zhai and can be regarded as the old Wu Jian Quan form. Not many people, however, learnt this form and there are few records of it. The form itself is still quite similar to Wu Jian Quan's later form and besides minor variations, it remains essentially the same. There are still those who practice this form so it is not extinct and provides a valuable insight into the early teachings of Wu Jian Quan. Wu Jian Quan continued to refine his skills and to modify his form. He removed some of the more vigorous movements and made it slow and even in tempo. This also facilitated the easy learning and transmission of the art. He taught this form exclusively in his travels and finally based himself in Shanghai where his family still resides. Wu Jian Quan's influence, popularity and the large following he amassed established his form as the standard one for the Wu family. Today it is still the most practiced version of Wu Jian Quan Taijiquan and it is the one that all variations are measured against. We are fortunate that photographs were taken of Wu Jian Quan's form and we can see his high attainment in the art. A film was shot of him performing Taijiquan in Shanghai but the film has since been lost through the turmoil of the ensuing years in China. This form was first made public by the Jian Quan Taijiquan Association headed by Mah Yueh Liang and Wu Ying Hwa in 1982. It proports to be the original style taught by Wu Jian Quan before his modification of the form. We do not have any early information on a Wu Jian Quan fast form before this and are unable to verify its authenticity. But Mah Yueh Liang is Wu Jian Quan's recognised successor and such a form is still a legitimate form of the Wu Jian Quan lineage. The form is done relatively faster than the normal form and there are modifications to the postures to accomodate a more martial aspect. The advanced fast training is not unique to Wu Jian Quan's Taijiquan and can be found in other Yang related lineages. Variations to the Wu Jian Quan style began with Wu Kong Yi who taught a form that was slightly different from that of his father. This is attributed by some to be because of his training with Yang Shao Hou but we have no verification for that. In an effort to promote Wu Jian Quan Taijiquan, shorter sets were created as many people did not have the patience or the time to learn the long sequences of the traditional sets. One of these sets is the 37 posture Wu Jian Quan form developed by master Wang Pei Sheng, a student of master Yang Yu Ting. Mah Yueh Liang and Wu Ying Hwa have also created a shortened version of the traditional long set of only 30 postures. These variations have certainly made Wu Jian Quan style Taijiquan easier to learn and savour. Whether they will retain their popularity remains to be seen. The original form of Wu Jian Quan will always hold a mystique that will beckon to a serious student of his lineage. Through the efforts of Wu Jian Quan's sons, grandsons, great grandsons and students, his style of Taijiquan has spread across the world and ranks second only to the Yang style of Taijiquan in terms of popularity. Wu Kong Yi was involved in a much publicised fight with Chen Hak Fu, a White Crane stylist half his age. That he could hold his own against a younger fighter established for many the credability of the his style as a fighting art. For others, the fight was seen more like a brawl than a match between two highly skilled exponents but as Robert W. Smith, a respected authority on Asian martial arts, noted in his book when he showed a friend a film of a full contact Taiwanese-Hong Kong Tournament, the missing elements are contact and pain. It makes a vast difference and real fights seldom look as good as text book examples of applications. This is especially true when faced with exponents from two completely different styles of fighting. Wu Kong Yi went on to establish schools across South East Asia and his sons continued this tradition and not too long ago, representatives of the Wu family have made North America their home, bringing their family art to the region. Wu Jian Quan style Taijiquan continues to grow in popularity and is spreading throughout the world through the efforts of its enthusiastic practitioners. And more and more material is becoming available in different languages on this style of Taijiquan. This style of Taijiquan has remained relatively unsplintered due to the acknowledged leadership of the Jian Quan Taijiquan Association in Shanghai. 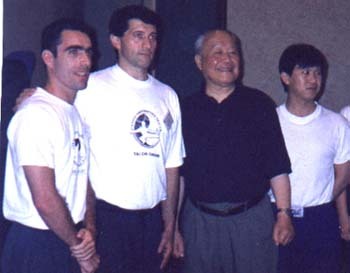 Through the efforts of Mah Yueh Liang and Wu Ying Hwa, the family of Wu Jian Quan Taijiquan remains committed to promoting the art in the original spirit of its founder Wu Jian Quan.